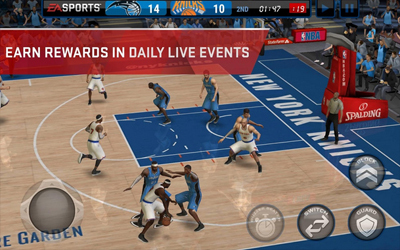 The latest NBA LIVE Mobile APK 2.1.4 has been released and it’s free for everyone. So, we can download it and play on android for free. For basketball lovers, this game is one of the most awaiting games this year. EA Sports, one of the best game developers release the game by bringing excellent features supported by the epic 3D graphics.When starting the game, you will be prompted to enter your age. Then, like the other games, we have to input the nickname, then we can choose the team that we play. Next we will go to the tutorial. In this game, we are presented with virtual control that has been popular. On the left side we use to move the player. While on the right side serves to perform actions such as shoot, pass and drive when we are in position to attack. Get ready to drive the lane with our latest update. We’ve improved the gameplay by tuning the AI, making for a more authentic NBA experience. Plus, we’ve made a number of other adjustments to keep you balling, including ensuring Google Play achievements are correctly awarded.